For measurement of temperature by touch method, a thermometer with probe is required. This probe (basically a temperature sensor) will be inserted into to the food item and temperature can be measured. 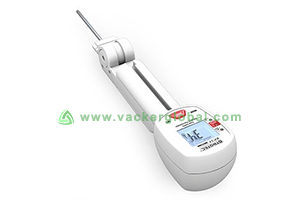 For measurement of temperature by non-touch method, the user will not be able to use the probe for various reasons including safety and hygiene reasons. For such methods, Infrared method has to be used. This is called IR thermometer. IR thermometer sends an Infrared ray to the subject and measures the temperature. The temperature is then displayed on the display panel of the thermometer. The infrared measurement shows only temperature of the surface. Whereas the probe insertion can measure the temperature deep inside as long as the probe is inserted. Both the methods have its own applications and purposes. 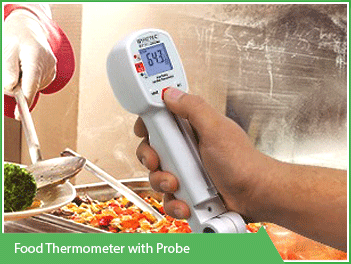 This is in principle a food core thermometer combined with an Infrared thermometer in a single instrument. Also it is preferred that the measurement has to be in line with the temperature limits defined as per relevant HACCP procedures of the user. Such temperature limits are programmed in this device. Type of ingress protection (IP rating) has to be high, at least IP 65 so that the instrument will be protected against water. Can you program permitted temperature ranges as per your HACCP procedures.